Playing a game of Pathfinder can be great fun, whether you’re a player directing your heroic character through an unexplored dungeon or a Game Master running all the monsters, traps, and NPCs the players get to meet. But if you’re the GM, building adventures can be as rewarding as running them! When you decide to build an adventure, you should come up with a story for it. Is it about a haunted house hiding an old family heirloom? An abandoned mine that’s become infested with giant bugs? If you’re stuck, randomly roll up a storyline from the table below. 1 The wolves in the nearby forest are led by werewolves who have taken over a remote forest watchtower. 2 An old ring of standing stones on the hill sits above a dungeon that has become infested with elementals. 3 A tribe of goblins led by a barghest moves into an old shipwreck near a partially collapsed lighthouse. 4 A noble hires the PCs to investigate a supposedly haunted house at the edge of town that he’s interested in buying—but only if the PCs can defeat the ghost that haunts it first. 5 An ancient mummy brought from a distant pyramid awakens in the basement of a large museum and begins using its magic to animate statues and skeletons. 6 The town jail has been taken over by shapeshifting doppelgangers who are rounding up people and robbing their homes. 7 A group of boggards led by a green hag has been attacking river merchants. Their hideout is built among the roots of a giant swamp tree. 8 An evil cleric has moved into a creepy abandoned temple so he can start raising zombies and skeletons to attack the town. 9 A tribe of orcs has overrun a castle at the edge of the kingdom. Someone must invade the castle and reclaim it from the orcs. 10 An ancient dwarven mine has been taken over by a den of troglodytes. A dwarf merchant hires the PCs to clear out the mine. 11 A recent earthquake exposed a warren of monster-infested caves overlooking a welltraveled trade route. The manticore that rules these caves is merely the toughest of many monsters, which include numerous giant spiders. 12 The thieves’ guild in the city sewers has become more aggressive—it’s been infiltrated by serpentfolk who are using the guild as a hideout to raid the slums for humans they can eat. Most adventures focus on a single location or dungeon. Once you know your adventure’s story, you can start drawing the map. The easiest way to draw a dungeon map is to start with a sheet of graph paper. If you keep your dungeon in an area of 24 squares by 30 squares, you’ll be able to draw the entire dungeon on your Flip-Mat. When you first draw your map, you should use a pencil so you can make changes easily. You can also jot down notes for each room as they come to you, like “guard post” or “spider nest.” Here are several other things to keep in mind while drawing your map. Use symbols to represent common features found in most dungeons— doors, stairs, traps, pillars, and more. Using these standardized map symbols keeps your maps from becoming too cluttered with written notes and tags. Common map symbols are shown on the inside back cover of this book. 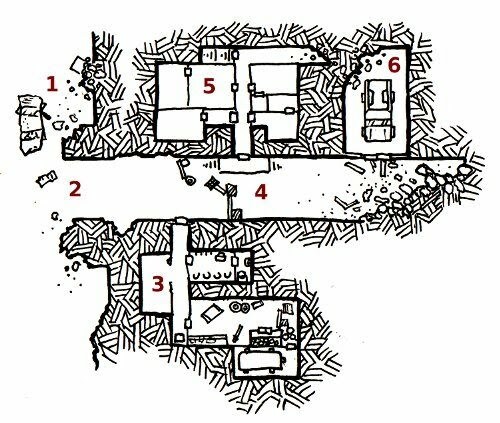 Unless you’re specifically designing a dungeon that is partially abandoned or you’re trying to lull your PCs into a false sense of security, don’t add too many empty rooms, as they can clutter your map and get boring fast. Unless you’re certain you don’t want to return to your dungeon later or want it to serve as a truly enclosed area, it’s a good idea to allow for places to expand later for future adventures. A tunnel running off the edge of the map, a flight of stairs leading down, or a large pit can all lead the way to new areas. Refrain from creating symmetrical dungeons in which one half is an exact mirror image of the other—it’s unrealistic, and the players will be disappointed when they realize that they only have to explore half of a dungeon to see it all. Just as symmetry is bad, so is overreliance on square or rectangular rooms. By including strangely shaped rooms, alcoves, multilevel rooms, irregular caverns, and other variations, you provide each room’s combat encounters with different tactical elements and your map becomes a more interesting location. Remember that combat in the Pathfinder RPG is based on 5-foot squares. If you fill your dungeon with 5-foot-wide hallways, you might end up with combats in which some of the player characters can’t actually get into the fight! Mix it up a little by including 10-foot-wide hallways or wide spots in a narrow hallway where PCs can move past each other. Avoid the temptation to make your map into a maze— exploring one gets old quick once you’re playing, especially if you spend most of your time during the game drawing twisted corridors on your mat when you could be running a combat! Once you’re happy with your map, inking the pencil lines makes the map a lot easier to read. You can use a fat-tipped pen to draw solid walls. Thinner pens are great for drawing doors and map symbols. Adding color (whether with pens or colored pencils) for things like water or fire makes your map even easier to read. If you have a computer, you can scan your map and then use an image-editing program to refine it. This is handy if you make an error on the map with ink and need to fix things. Adding additional elements to your map can make it more attractive. Details such as furniture, fire pits, pillars, and so on add a touch of realism to inhabited dungeons. All that’s left is to number each room—doing this makes it easy for you to keep track of which encounters go where in your dungeon. If possible, use a pen of a different color from anything else on your map so the numbers (also called “tags”) stand out and are easy to see. Alternatively, you can circle the number tags or mark them with a highlighter. Your dungeon should feature a variety of encounters so that things don’t get repetitive when you play it. By making sure to include many types of encounters in your dungeon, you not only keep things interesting, but you also have a much better chance at giving the players at least one thing that they’ll really enjoy. Keep the players guessing—it’s a lot easier to keep their attention if they’re not sure how the next room will challenge them. As you create encounters, jot down any bits of information you think you’ll need to remember for each one. This includes a description of the room you can read to the players, lists of monsters in the room (with page numbers for their stat blocks), what treasure can be found in the room, and any other notes that could be helpful once you’re running the encounter in the game. Use the encounters in “Black Fang’s Dungeon” at the start of this book as examples when writing up encounters. The different types of encounters are listed below. In a combat encounter, the PCs are faced with a foe or foes that block their progress—in order to complete the encounter, the PCs must defeat these foes in combat. A combat encounter can be with a single opponent or a group. In most dungeons, combat encounters are the most common kind of encounter. When you put a combat encounter in a dungeon, you should first pick what Challenge Rating (CR) you want that encounter to be. It’s best to pick a CR that’s the same as the average level of the PCs in your group—an encounter whose CR score is equal to the party’s average character level is considered a “normal” encounter. You can make an easier encounter by picking a CR for your encounter that’s lower than your party’s average level. If you want a particularly tough encounter, make its CR 1 higher than the party’s level. For a climactic encounter, you might want to make it 2 or even 3 higher than the party’s level—don’t go beyond this, though, if you want your heroes to have a fighting chance to win the encounter! For especially difficult encounters, you should consider including other encounters in the dungeon that give the PCs some treasure or clues to help them out, similar to how the PCs can learn about Black Fang’s weakness from the goblins in Area 8 of “Black Fang’s Dungeon,” or how they can find the +1 dragon-bane longsword in Area 7. Once you know what CR your encounter should be, take note of your “encounter budget,”, then look through the creatures in the Monsters section . When you start choosing monsters for the encounter, find the XP value listed in each monster’s description, then add up all the monsters’ XP values. Once that total is equal to your encounter’s encounter budget, stop—you’ve built an encounter of that particular CR. If you’re a little bit over or under your budget, that’s okay, but try to get as close to your budget as possible. You can add obstacles and traps to encounters with monsters as well—just add in the obstacle or trap XP to your budget as if it were a monster of its CR. For example, say you wanted to build a CR 2 encounter. Looking at the encounter budget table, you see that you have 600 XP to spend on monsters. Since this is a dungeon infested with giant bugs, you decide to have this encounter be with giant centipedes. A giant centipede is worth 200 XP, so you can afford to put 3 of them in this encounter (200 × 3 = 600). Later in the dungeon, you want a climactic CR 5 encounter. Looking at the table, you see that a CR 5 encounter has a budget of 1,600 XP, and decide that the giant centipedes are the pets of a serpentfolk. Since a serpentfolk is only worth 1,200 XP, you add some more giant centipedes to the encounter. Adding 2 brings the encounter’s total up to 1,600 XP—a perfect CR 5 encounter! This kind of encounter presents the characters with a dangerous condition they need to navigate in order to proceed. A room filled with poisonous mold, a chasm with a rotten rope bridge, a pool of lava, an unstable chamber with a crumbling ceiling, or even something as simple as a locked door can serve as an obstacle. For the PCs to progress safely through an obstacle, they generally need to make a skill check or saving throw— success means that they make it past the obstacle safely (see common skill check DCs). Failure could mean that they simply didn’t make it through and can try again, but often failure brings with it damage or some sort of condition. An obstacle that only requires a DC 10 skill check or saving throw is generally an insignificant one—on average, a typical character will be able to pass such an obstacle. An obstacle that requires a DC 15 skill check or saving throw is relatively difficult. A skilled character has a fairly good chance of passing this type of obstacle, but a character who’s not good at the obstacle’s associated skill will probably have a tough time. An obstacle that requires a DC 20 skill check is difficult for even a skilled character to pass, and often nearly impossible for one who’s not skilled at all. These obstacles should generally be ones where one single successful roll allows the entire party to progress. Puzzle encounters present the players, not the characters, with a challenge. These can be riddles, shifting tiles, mazes, word puzzles, or anything else that must be solved by brain power, logic, or experimentation. You can enhance a puzzle encounter by giving players a handout or prop that lets them directly manipulate or study the puzzle. A puzzle generally can’t be solved with die rolls, but if your group gets stuck on a puzzle, you should consider letting them make appropriate skill checks to learn clues (or even the solution), especially if they’re getting frustrated. After all, even if a player is stumped by a certain puzzle, his character might not be! Roleplaying encounters are among the more complex types of encounters. They most often occur when the player characters are presented with a creature or NPC who doesn’t immediately want to start a fight. This could be an encounter with a prisoner who wants to be rescued, a fellow dungeon explorer who wants to trick the player characters into entering a dangerous room first, or a monster who might tell something useful about the dungeon if the PCs bribe or befriend it—virtually any situation where the players need to engage in conversation with you to resolve the situation. You can combine roleplaying encounters with other types of encounters. For example, an encounter where the PCs must make Diplomacy checks to convince a guardian to let them pass without a fight is a roleplaying and obstacle encounter, while an encounter in which the PCs must answer a ghostly spirit’s three riddles is a roleplaying and puzzle encounter. Most roleplaying encounters combine well with story encounters, but you can combine them with combat encounters by having the player characters enter a room where a potential ally is fighting against a common enemy. You can also begin a combat encounter with a roleplaying encounter—perhaps the hungry ogre wants to interrogate the PCs about which one of them is tastiest before she attacks! One particularly useful kind of roleplaying encounter is the quest encounter—in such an encounter, the PCs can learn of a task that they can then attempt to undertake. Usually, a quest-giving NPC promises a reward if the player characters manage to successfully complete the quest he offers—but such a reward can merely be permission to delve deeper into the dungeon the NPC is guarding. Story encounters rarely involve any actual danger or impediment to physical progress through a dungeon, but they are often the most important encounter type, for they allow the players to learn about your dungeon and world. There’s no point in creating a great history for a dungeon if there’s no way for players to learn about it! A story encounter can come in the form of an old journal, a carving on a wall, a conversation with a friendly monster or talkative ghost, or any such opportunity for a player to make a Knowledge check to learn more about the dungeon. These encounters are similar to obstacles in that they are dangerous and can be defeated with a combination of skill checks, saving throws, attack rolls, or spells. Their primary difference from obstacles is that traps are hidden from view and can strike with little or no warning. You should use traps sparingly, as including a lot of traps slows down the game as increasingly paranoid players check every 5-foot square for hidden perils. Often, it’s a simple matter of giving the players some kind of warning (such as a story encounter) that they’re heading into a trapped area. Like monsters, all traps have a CR value. Unlike monsters, you should usually have the PCs encounter one trap at a time. When PCs defeat an encounter (whether by scaring away monsters, bypassing a trap, or learning information in a story encounter), award them experience points (XP) equal to the encounter budget of the encounter (divide this amount evenly among the PCs in the group). Story and roleplaying encounters are considered to have a CR equal to the average party level. While the advice above is specifically for adventures that take place in dungeons or similar environments (caves, castles, buildings, and the like), you can also set adventures in the wilderness, in bustling cities, or anywhere else. The big advantage a dungeon adventure has is that the dungeon’s rooms and corridors serve as a sort of “track” the PCs can travel along: you know where the PCs can go, and don’t have to worry about where they won’t go. But moving out of the dungeon allows for a number of exciting new adventure opportunities. Consider the following two types of adventure locations if you’re looking for a challenge! A wilderness adventure presents the PCs with wildlands that they must explore, but you can also use a wilderness adventure as a prelude to a dungeon, in which case the PCs must travel through an inhospitable land even before they set foot in the dungeon itself. The easiest way to build an adventure like this is to build the wilderness almost as a dungeon, with the corridors and rooms becoming trails, clearings, ledges, bridges, and other areas of open ground, and the stone walls becoming dense undergrowth, cliffs, water, or other difficult-to-navigate obstacles. With effort (and lots of Acrobatics, Climb, or Swim checks), persistent PCs can push through these obstacles and explore the encounters in any order they wish. Building wilderness adventures can be tricky, since you can’t be sure what order the PCs will experience the encounters in, but the added freedom of choice can be a liberating and exciting new element once players have grown accustomed to dungeons. In some ways, town and city adventures are a mix between wilderness and dungeon adventures, in that the city’s streets and buildings function like dungeon halls and rooms, but the easy access to the buildings allows the players to move about however they want. Roleplaying encounters should be quite common in urban adventures, but this doesn’t mean that dangerous encounters like combat and traps can’t occur, especially if the PCs blunder into a part of the city where thieves lurk. One of the great parts about this game is that players don’t have to stop playing their favorite characters once an adventure ends—there are always more adventures to go on. Over time, they form a series of linked adventures called a campaign. While you can certainly just build a campaign out of a series of adventures and let the overall story evolve from there, it can be even more satisfying for you to come up with an overarching storyline for your adventures. In this way, you can think of your whole campaign almost as a television show, with each adventure as a single episode. Taken as a whole, the adventures should lead into each other in a logical manner, starting small but building over the course of several adventures to a large and satisfying climax. One thing that’s important to keep in mind is the fact that you as the GM aren’t the only one telling the campaign’s story. The characters themselves are the stars of the show, and you can expect that their players will come up with unexpected solutions to the problems you present them with, and may even decide to explore areas of an adventure you hadn’t planned for. While you as the GM get to build the adventure, it’s the players who actually decide how the story ends. Don’t try to force them down any path that they don’t want—if the players decide to turn left, missing the dungeon ahead to the right, you can either move the dungeon to the left, or you can roll with it and see where the adventure takes you next. If you let the players decide where they want their characters to adventure next, the best way to keep things manageable is to build up an imaginary world for their characters to live in. There are enough adventure possibilities in even a small region to keep any group of adventurers busy well into 5th level. You can use Sandpoint as the setting for your adventures—not only does the town provide the player characters with a place to sell loot, buy gear, and interact with friendly NPCs, but it’s also a great place for the PCs to hear rumors about new quests and opportunities for adventure. You can also use Sandpoint as a template or inspiration for your own creation. Perhaps your world is a vast desert, with the PCs based in a town at the edge of an oasis. Maybe you’d rather have your world be a spooky mountainous region where villagers are plagued by undead. Or perhaps you’d rather start in large city, complete with vast sewers and dungeons underfoot. This section will help you create your own adventure set near Sandpoint. The craggy hills known as Ravenroost lie just east of town. They’re home to large flocks of ravens and a few goblin tribes. Rumor has it that the dragon Black Fang, recently driven from his dungeon, has been seen at a ruined tower called Raven’s Watch, speaking to a mysterious, dark-robed figure. Whoever the dragon is talking to can’t be a friend of Sandpoint! Mayor Kendra Deverin comes to the PCs once again, asking them to travel to Raven’s Watch and find out why Black Fang is so interested in the area. When the PCs arrive at the site, they find the tower to be only a crumbled pile of stone. A search turns up two points of interest. First, human footprints and the unmistakable clawprints of Black Fang are scattered throughout. Second, some of the ruins have been cleared away, exposing a closed trap door in the ground. If the characters lift this trap door, they see a flight of stairs leading down into the dungeons below. The map at the top of this page can represent the layout of the dungeon below Raven’s Watch, and consists of an old prison connected to a few ancient caves dug recently by a pack of ghouls. This is a simple, hand-drawn dungeon map that will fit perfectly on the back of your flip mat. Your dungeon maps don’t need to look professionally drawn like the map for Black Fang’s Dungeon— the hand-drawn map of Raven’s Watch works just as well. Originally intended to serve as a prison for local criminals, Raven’s Watch was abandoned many years ago when Sandpoint built a jail below the town garrison. Now this dungeon is the home of a vile priest named Thelsikar, an evil cleric who worships a hideous demon goddess named Lamashtu, the goddess of monsters and nightmares. Thelsikar is using the dungeon to collect monsters, with the aid of several stupid goblins and a few ghouls. The demon goddess also gave Thelsikar a vision of how to brew a potent elixir that greatly empowers a dragon’s strength. Thelsikar has already given Black Fang the first dose of this elixir, and has promised Black Fang another dose, but it’ll take many days to brew it. Black Fang has grown in power as a result of the first potion (his description now matches that of the black dragon). As the PCs explore the dungeon below Raven’s Watch, they should be able to piece together Thelsikar’s plan (both from the goblin minions as well as from the detailed journals hidden throughout the dungeon). By defeating the evil cleric, they can prevent Black Fang from growing even more powerful— and among Thelsikar’s treasures they’ll find a map that reveals the location of Black Fang’s newest lair! That’s all we’re going to do for you! We’ve given you the basic plot for the adventure, along with a map of the chambers. What’s left for you to do is to decide what each of the rooms is—an evil temple, a spooky cave, old prison cells, or whatever you think fits the adventure. Next, write down encounters for those rooms, including picking monsters and placing treasure. Don’t forget to place a few story encounters so the PCs can piece together the dungeon’s story. As for where the campaign goes from here, and where exactly Black Fang’s new lair is located—that’s up to you!